Frans Hals is often overshadowed by the other two great artistic geniuses of the Dutch Golden Age, Rembrandt van Rijn and Johannes Vermeer. Yet there is one dimension in which Hals stands clearly apart not only from his contemporaries, but from all but a few of the great artists in the entire western tradition of visual art. This is in having made his greatest artistic contribution after the age of 80. We can see that contribution today, placed within the context of a superb collection representing nearly every phase of Hals' long career, by visiting a single museum. Little is known of Hals' early life; even the year of his birth is uncertain. He was born in Antwerp, probably in 1582 or 1583. His family migrated to Haarlem when Frans was a young boy, and he would spend the rest of his life there, until his death in 1666. So it is appropriate that the Frans Hals Museum is located in Haarlem. A 15-minute train trip from Amsterdam's Central Station, and a short walk through the center of the beautiful and immaculately-preserved town of Haarlem, take visitors to the elegant 17th-century brick building, built around a large courtyard, that has been the Frans Hals Museum since 1913. The Hals Museum contains an excellent collection of works by other Haarlem painters of the Golden Age, including genre scenes by Jan Steen and Adriaen van Ostade, landscapes by Jacob Ruisdael, cityscapes of Haarlem by Gerrit and Job Berckheyde, portraits by Johannes Verspronck and Judith Leyster, and still lifes by Willem Heda and Pieter Claesz. But the stars of the collection are the works of Hals. Hals was a classic late bloomer. The scholar Seymour Slive explained that his early work is unknown: "What the artist... did before he was about twenty-eight or twenty-nine years old remains an unsolved riddle." In 1616, in his early 30s, Hals painted what Slive called "the first monumental landmark of the great age of Dutch painting," a group portrait of the officers of Haarlem's civic guard. This was the first of five magnificent group portraits of the guard company's officers that Hals made between 1616 and 1639. Each of these includes a dozen or more figures, and measures more than 10 feet long. All five of these hang in a single large room at the Hals Museum. 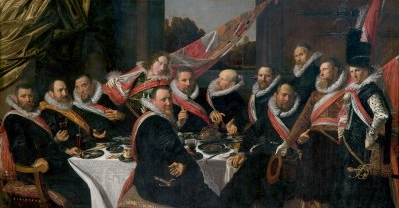 Officers and sub-alterns of the St George Civic Guard, Frans Hals, 1639, Frans Hals Museum, Haarlem. Hals is second from left in the back row. Hals was a quintessentially experimental painter, whose art was based on perception rather than conception. He evidently painted directly: there is not a single known preparatory drawing--or indeed drawing of any kind--by Hals. Radiographs of his paintings reveal that he began with brush sketches on the canvas, but Anton Erftmeijer noted that he "did not feel bound... by these generally loose and dynamically constructed compositions," for he made many changes as he painted. Hals clearly loved the look of paint: Slive observed that "only Velazquez and the late Rembrandt exploited the viscosity of oil paint with equal ingenuity." Hals was a visual artist, who painted only what he saw: in Slive's words, "Purely imaginary subjects hardly interested him... Thrown upon the resources of his own imagination he must have been lost and unable to proceed." His oeuvre was dominated by portraits: "apparently Hals felt inspired to paint only when he was confronted by a fellow human being." And like other great experimental artists, Hals' work gained in a power over time: thus Slive reflected that "Portraits of the last years have some of the psychological penetration and restraint which characterize the majestic works of Rembrandt's mature phase." Near the end of the museum's exhibition sequence, a smaller room holds five paintings by Hals, all made later in his life, and all more somber than the guard company portraits. Two of these are the group portraits that have come to represent the greatness of Hals in old age (so for example they are more frequently illustrated in textbooks of art history than any other works by Hals). 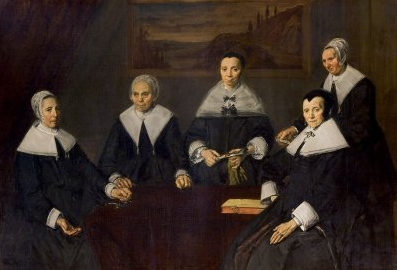 Both made in 1664, when Hals was 81 or 82, one portrays the regents of Haarlem's old men's almshouse, the other the regentesses. Hals' virtuoso brushwork is still present in these magisterial portraits, but here it is used to give insight into the austere personalities of those sober, elderly men and women. The prospect of facing either group, as in the course of being admitted to the old men's home, must have been very daunting, and Hals makes this real for us: he not only captures the dour appearance of these functionaries, but also the chilling sensation of coming before them as a supplicant. (Hals may well have been able to imagine this feeling, for although he never lived in the almshouse, he was very poor in his final years, and may have considered entering the home.) 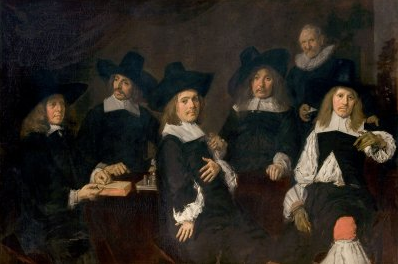 The impact of these paintings is heightened by the startling realization that the building in which we see them today is the same one in which these officials sat in 1664: the 17th-century old men's home is today the Frans Hals Museum. On the way back to the railroad station, I stopped to visit Hals' grave in St. Bavo's Cathedral, which towers over Haarlem's beautiful main square. Inside, near the altar, is a black stone in the floor, simply marked with Hals' name. The Dutch are not ostentatious, and there is no eulogy for the most important person who ever lived in Haarlem, who effectively gave immortality to the town's prosperous 17th-century burghers. In the process, he also gave us a powerful and lasting demonstration of creativity in old age.